The North Carolina Property Tax Commission (PTC), the state level property tax appeals body, has published its schedule of hearing dates for 2019. The PTC generally meets once a month for 4 days for hearings. 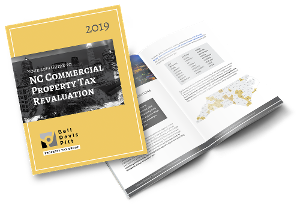 If you are unsatisfied with the value placed by the county tax office on your property, there is an appeal process by which you can challenge the county value. The first step in this process is an appeal to the local Board of Equalization and Review. If still not satisfied with the result, you can next appeal to the Property Tax Commission. The PTC sits as the statewide board of equalization and hears appeals from all county BERs. In order to promote renewable energy development, the NC legislature passed various incentives for the development of solar energy. One of these was NCGS Section 105-275(45), which provides that 80% of the appraised value of a solar energy electric system shall be excluded from taxation. When tax professionals hear the term "double taxation," they tend to think of income taxes paid twice on the same source of income — like when income is taxed at both the corporate level and the individual level. The term applies equally in certain property tax situations in North Carolina. Unlike in the corporate tax scenario, in the property tax scenario, double taxation is improper and illegal. The change in the North Carolina Governor's office this year now brings a change in the make-up of the Property Tax Commission ("PTC"). The PTC is a 5-member, quasi-judicial body that hears appeals after the Board of Equalization and Review ("BER") level in the county where the property is located. Many owners of commercial properties in Forsyth are recieving revaluation notices that do not state a value at all. Instead, where the new 2017 value should be, the notices say "VALUE PENDING." Meanwhile, the deadline in Forsyth County for appealing 2017 property values to the Board of Equalization and Review is June 30, 2017. "Tax season" might be officially over, but property tax revaluation is in full swing for Alamance County. If you own property in Alamance County, you should have recieved your revaluation notice by March 1. These notices set forth the new assessed value of your property effective January 1, 2017. 2017 is the year for the "long" session of the General Asembly in NC, meaning that this is the year that the biennial budget is passed and more legislation is proposed than in the off-year or "short" session. A bill introduced on March 23 by Senators Tarte, Tucker, and McKessick would, if passed, revolutionize the process of property tax appeals in North Carolina. Property tax revaluation notices in Forsyth County have been mailed advising property owners of their new values. Average property values in Forsyth County increased by about 6% from the last revaluation in 2013, according to a statment made by John Burgiss, the tax assessor, in arecent Winston-Salem Journal article.